NRA-ILA | Will Darkness Fall On The Land? Will Darkness Fall On The Land? Last year, then NRA President Kayne Robinson announced at the annual meeting of the Outdoor Writer`s Association of America (OWAA) that one of the foremost goals of the newly formed Free Hunters organization would be to protect the use of public lands by hunters. "The most vulnerable hunters--the ones that are quitting--are having a terrible time finding a place to hunt," Robinson told outdoor writers gathered there. Robinson recognized that a growing number of hunters were deserting their sporting heritage because it had become increasingly difficult to find a place to hunt. So Free Hunters was formed to stem this thinning of hunting`s ranks. There are those who can afford costly leases on which to hunt, but many of America`s rank-and-file sportsmen--the core constituency of hunting and the Second Amendment--are forced to drop out if public land on which to hunt is not available. However, the national media ignored the NRA`s proclamation of an invigorated hunting community taking the offensive to protect its heritage. Instead, so-called "mainstream" media latched onto the OWAA`s censuring of Robinson for speaking out against the Sierra Club`s support of political candidates dedicated to banning guns. Yet, while the news programs and dailies morphed the contention between NRA and OWAA into sound bites prophesying the decline of the NRA, we began working diligently in state legislatures throughout the country, working to protect the lands that will keep hunting`s ranks secure, and make America`s hunters a viable voice in decades to come. Already, the efforts of Free Hunters and the NRA have proven fruitful. From Arkansas to Oregon, Maryland, Georgia and beyond, your NRA has been a force in passing, or reaching the cusp of passing, No-Net-Loss legislation. 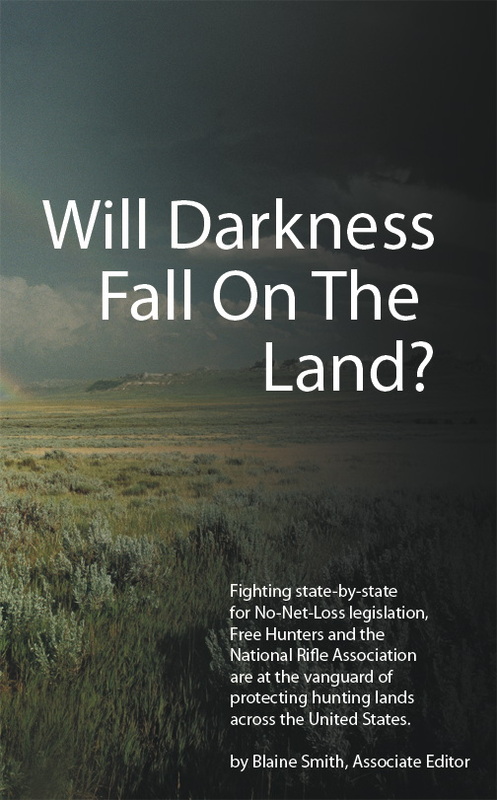 No-Net-Loss simply refers to the mandate that, should any public land be closed to hunting, an equal number of acres must be opened for use by hunters. "NRA is working to protect every public hunting acre in America," said Dawson R. Hobbs, NRA-ILA manager of hunting policy. "By passing No-Net-Loss legislation across the country, we can create a base number of acres that will always be open to hunting. Then, we can work to expand that number by opening new lands to public hunting." In March, NRA aided in the passage of No-Net-Loss legislation in Arkansas. "There`s been a growing sentiment in Arkansas in recent years that hunting privileges have been removed from public land and given over to other recreational purposes," said Arkansas state Sen. Steve Higginbothom, sponsor of Senate Bill 1080, Arkansas` No-Net-Loss legislation. "Citizens of this state were losing net acres of land (for) hunting." That is, until NRA stepped in. Higginbothom says he learned the value of No-Net-Loss legislation from NRA, and received needed assistance in drafting the bill. Then, by including the Arkansas Game and Fish Commission throughout the legislative process, opposition to No-Net-Loss was basically non-existent, and Gov. Mike Huckabee signed the bill. "This No-Net-Loss legislation guarantees that the hunters of tomorrow will enjoy the traditions and learn the skills their parents and grandparents mastered in the woods and waters of Arkansas," said Chris W. Cox, NRA-ILA executive director. The Maryland legislature also passed a similar No-Net-Loss of hunting lands bill, again with the aid of NRA. House Bill 1086, the Maryland Hunting Heritage Protection Act sponsored by state Delegate Michael Weir, ensures that the Maryland Department of Natural Resources will "manage land under its authority to prevent, to the greatest practical extent, any net loss of acreage available for hunting opportunities on land managed by the department." Weir, a lifetime hunter and trapper and second-generation delegate whose father was a founding member of the Maryland Congressional Sportsman`s Caucus, said that the bill passed the state House with a minimum of opposition; when it reached the Senate, however, groups such as People for the Ethical Treatment of Animals (peta) and The Humane Society of the United States (HSUS)--both of which, Weir says, are powerful forces in the state of Maryland (HSUS has an office located in Gaithersburg, Md.) --escalated their attempts to have the legislation thwarted. Wayne Pacelle, CEO of the HSUS who is on record as saying, "If we could shut down all sport hunting in a moment, we would," personally testified in opposition to the bill in the state Senate. In addition to Pacelle`s testimony, HSUS released a statement opposing the legislation--further cementing their opposition to hunters. Yet, Weir said that bi-partisan support for the Maryland Hunting Heritage Protection Act, and a spattering of political compromise, effectively halted the anti-hunting groups` attempts to undermine the state`s hunting legacy. In April, the bill passed out of the state Senate, and currently awaits the signature of Gov. Robert Ehrlich, a strong supporter of gun owner rights. Weir anticipates Ehrlich will sign the legislation in May at a Sportsman`s Caucus celebration. "This bill sends a message to the anti-hunting extremists who are constantly attacking hunting in Maryland," Hobbs said. In Georgia, No-Net-Loss legislation is awaiting the signature of the governor as well. Senate Bill 206, sponsored by Sen. Tommie Williams, confirms that "department land management decisions and actions shall not result in any net loss of land acreage available for hunting and trapping opportunities on Department (of Natural Resources) lands . . . "
"The folks from NRA were very helpful," Williams said about the support he received in both constructing and passing the No-Net-Loss legislation. Though a bit of amending to the initial version of the bill was necessary to appease some, Williams said that the Georgia legislature is, for the most part, a pro-hunting body, so opposition to the legislation`s No-Net-Loss language was minimal. Williams anticipates Gov. Sonny Purdue, who received an "a" rating from NRA, will sign No-Net-Loss into law. NRA is also actively pursuing No-Net-Loss legislation in Oregon. Rep. Wayne Krieger, sponsor of House Bill 2529, was approached by NRA to protect public lands on behalf of Oregon sportsmen and women, and the 28 year veteran of the Oregon State Police Game Division leapt at the chance to help protect his fellow hunters. "A lot of lands have no public access, and I felt dollars from hunters needed to be used to open more land for hunters," Krieger said. The NRA Life member says that he was inundated with support for No-Net Loss legislation from Oregon`s proud and vocal hunting community--most of which, Krieger points out, are NRA members. Along with other various hunting and fishing groups, whatever opposition there was to this legislation has been decidedly hushed beneath the weight of NRA and unified sportsmen dedicated to protecting hunting lands for future generations. The legislation recently passed out of committee and was awaiting a vote in the state House at press time. As it now stands, H.B. 2529 institutes policy mandating that the Oregon Fish and Wildlife Commission shall "avoid making management determinations that result in a net loss of access to public lands used for wildlife management purposes for hunting." Krieger maintains that the outlook for the passage of No-Net-Loss in Oregon "looks good." While NRA`s alliance with various state legislatures to ensure passage of No Net-Loss of hunting lands is an important step in safeguarding hunting lands and, hence, America`s hunting heritage, each respective No-Net-Loss bill in each of the four states discussed contains peripheral aspects that will prove beneficial to hunting as well. For the most part, these various bills contain language that recognizes and places on the public record the importance hunting has played in the history of each state, and orders each state`s game departments to actively promote hunting. In Arkansas, for example, S.B. 1080 notes that, "The (Arkansas State Game and Fish) commission shall exercise its authority . . . in a manner to support, promote and enhance recreational hunting opportunities . . ."
The Maryland Hunting Heritage Protection Act, H.B. 1086, declares that state Department of Natural Resources shall, "manage land under its authority to support, promote and enhance hunting opportunities . . ."
And in Oregon, H.B. 2529 maintains that "the (state Fish and Wildlife) commission is required to give preference to hunting over other uses of public lands used for wildlife management purposes." "Anti-hunting groups have long fought to dismantle public hunting land in an effort to eradicate America`s sporting heritage," ILA`s Cox said. However, with the formation of Free Hunters, and the tireless efforts of NRA`s leadership and membership, the protection of hunting lands through No-Net Loss legislation will take yet another weapon from the anti-hunting community`s arsenal. While NRA and Free Hunters take their fight for No-Net-Loss to all 50 states, the fight to preserve hunting through other means will continue as well. Former NRA President Robinson`s vision when Free Hunters was formed was simple--save hunting. Just as he pointed to the loss of hunting lands that day at the OWAA meeting--and just as NRA has answered with No-Net-Loss legislation in several state capitols--Robinson pointed to increased government red tape choking the ranks of hunting, game agencies that are hostile toward hunters and a lack of public shooting ranges to practice before hunting as several other issues that need to be addressed to save America`s oldest tradition. Be assured that Free Hunters and NRA will continue to fight for all of these goals. Free Hunters is an organization founded on the purpose of actively protecting hunting rights and traditions for all Americans. You too can help. Convince a friend or family member to join Free Hunters. Contact your representatives at the local, state and federal level and let them know that your right to hunt is non-negotiable. And continue to watch these pages to learn how Free Hunters and NRA are fighting for hunting--and for you. Will America’s Safest Hunters Save America’s Hunting?